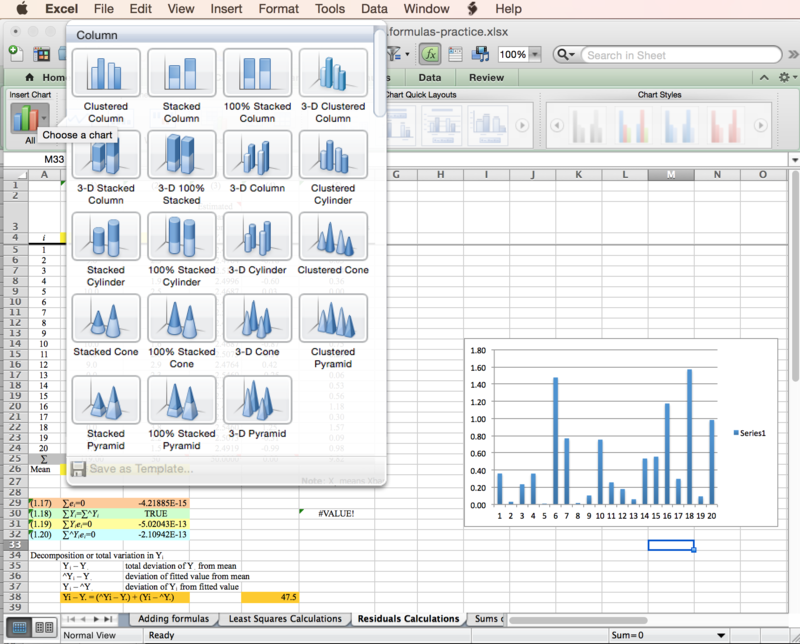 Spreadsheet data can be converted into many different ways of displaying data in charts. But one needs to know what type of display is best suited for the underlying data. 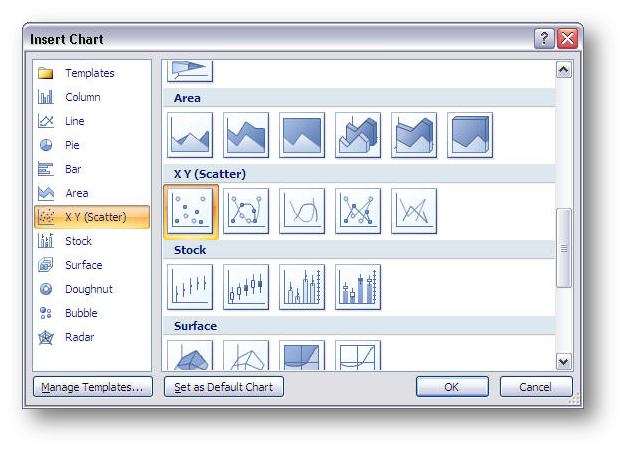 Data graphics visually display measured quantities by means of the combined use of points, lines, a coordinate system, numbers, symbols, words, shading, and color ... Modern data graphics can do much more than simply substitute for small statistical tables. At their best, graphics are instruments for reasoning about quantitative information. Often the most effective way to describe, explore and summarize a set of numbers - even a very large set - is to look at pictures of those numbers. 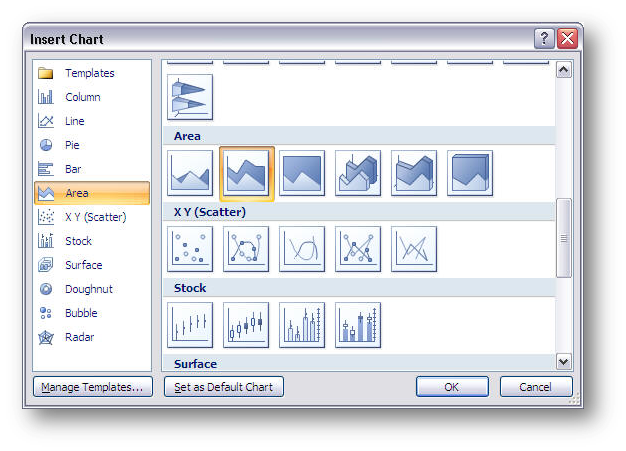 Furthermore, of all methods for analyzing and communicating statistical information, well-designed graphics are usually the simplest and at the same time the most powerful. 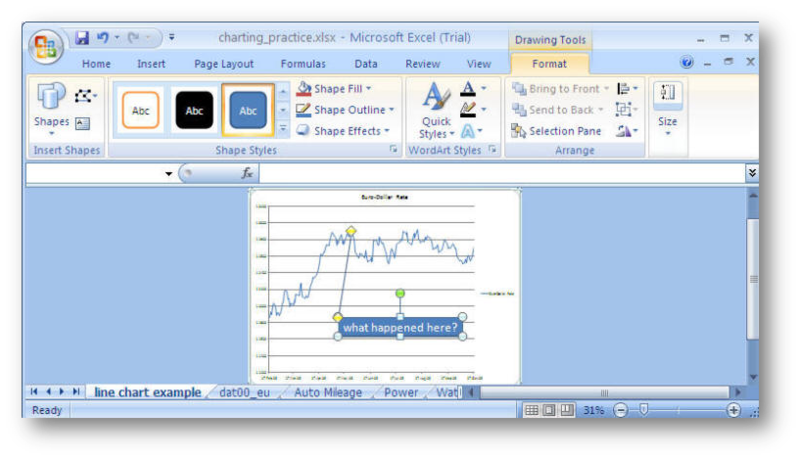 Charts are a useful way to illustrate data shown in worksheets. 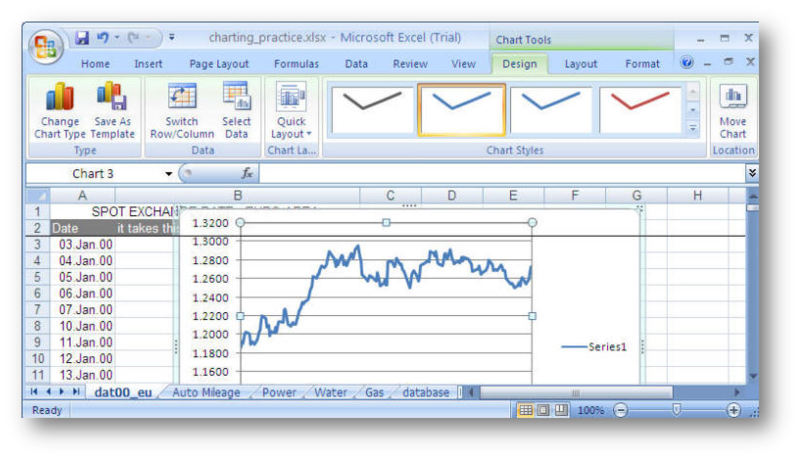 Excel has several different types of charts to select from depending on the sort of information you are using and the effect you wish to convey in the graphic. 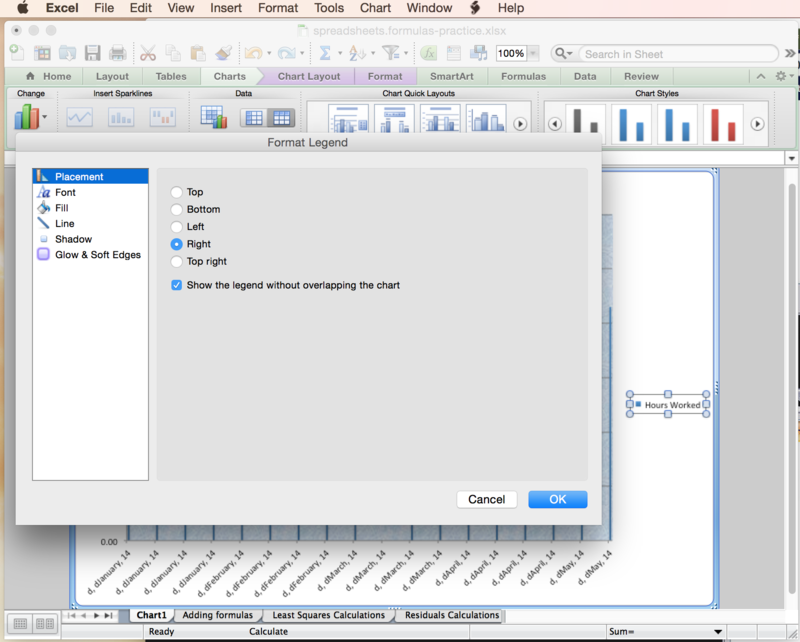 Column charts compare values across categories. bar charts are essentially the same thing, but oriented on the horizontal axis. 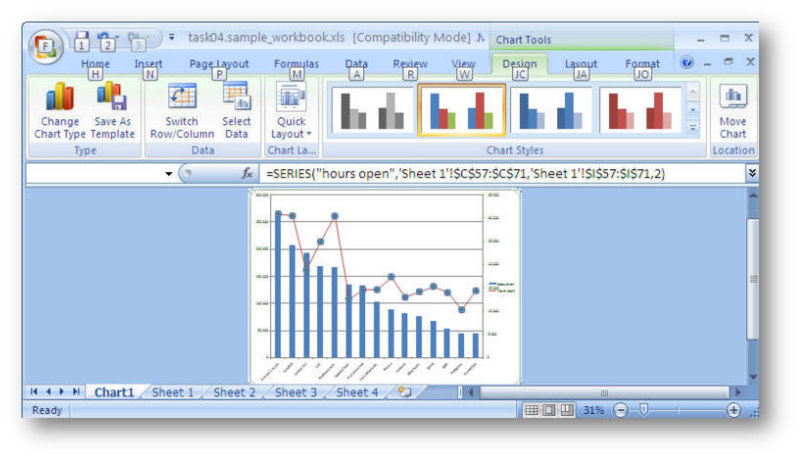 Excel asserts they are the best chart type for comparing multiple values. 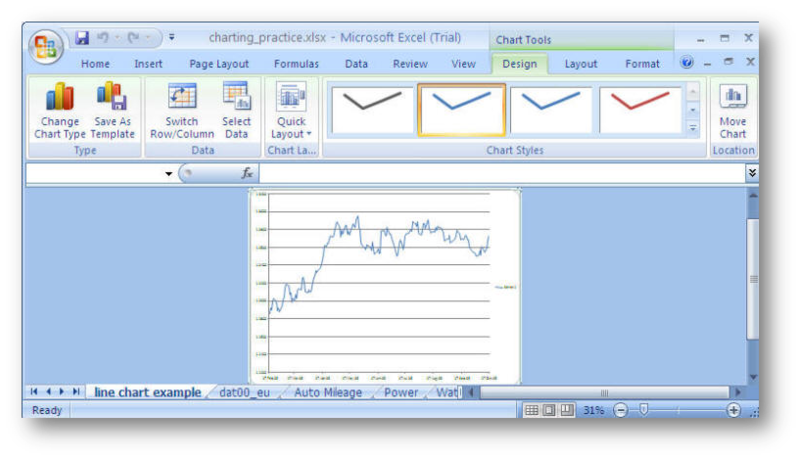 Line charts compare	continuous data over time against a common scale and are ideal for showing trends. But column charts do the same and in a more revealing fashion. Use a pie chart to show the relationship or proportion or parts to a whole, only when you want your chart to be metaphoric. ... the only worse design than a pie chart is several of them ... Given their low data-density and failure to order numbers along a visual dimension, pie charts should never be used. 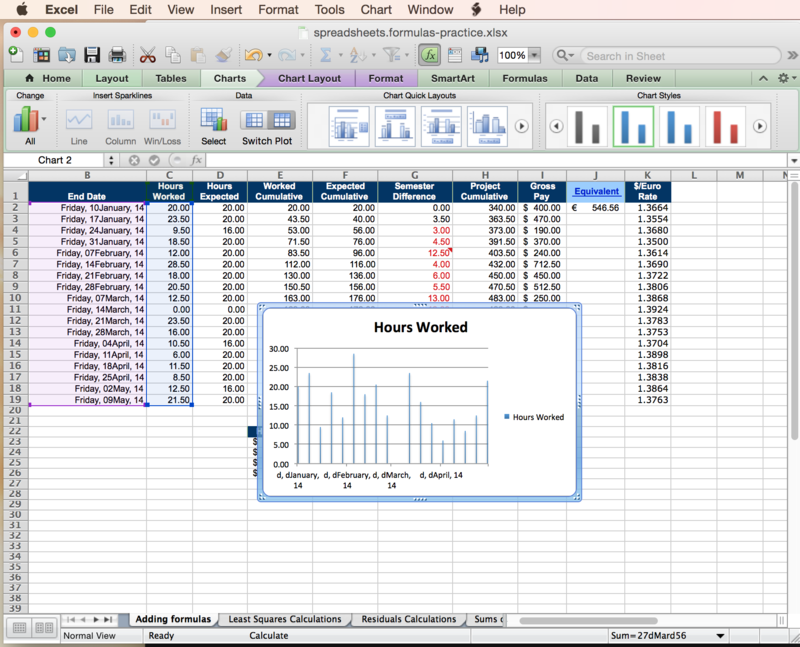 Area charts emphasize differences between several sets of data over a period of time. ... compare pairs of values, depicting them as sets of X and Y coordinates. in some charts, you can chart only one series. 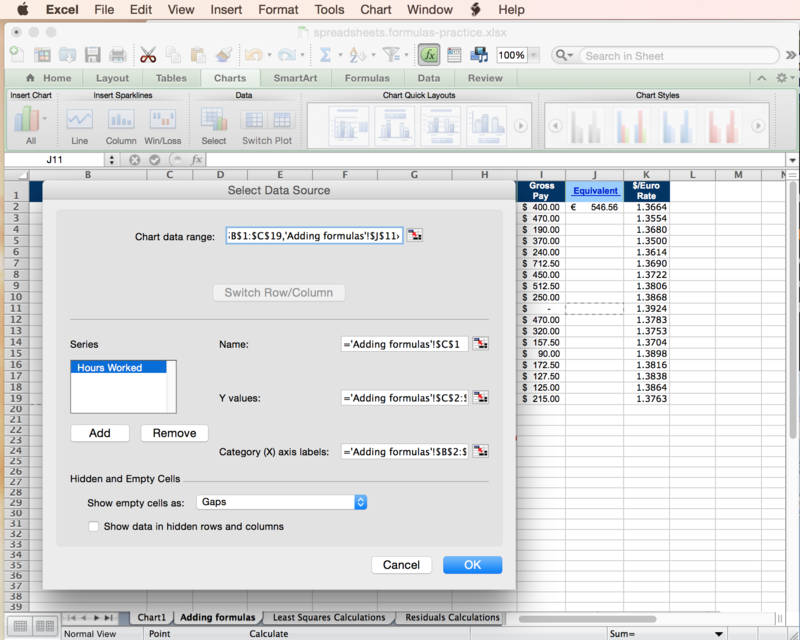 That means you can select only one set of data to chart. 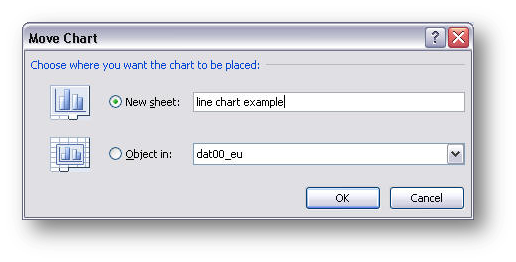 One can create the chart on a new worksheet or within the current worksheet, depending on the data is to be displayed. 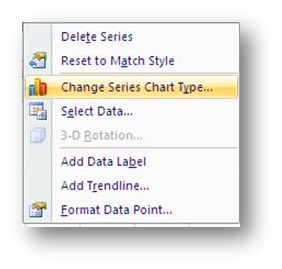 Change colored data series to patterns and shades of gray if you plan to use the chart in a print document. 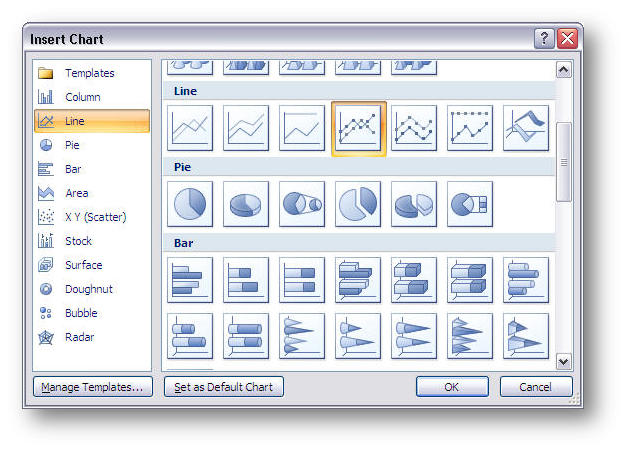 Select the Insert ribbon to see your chart options. 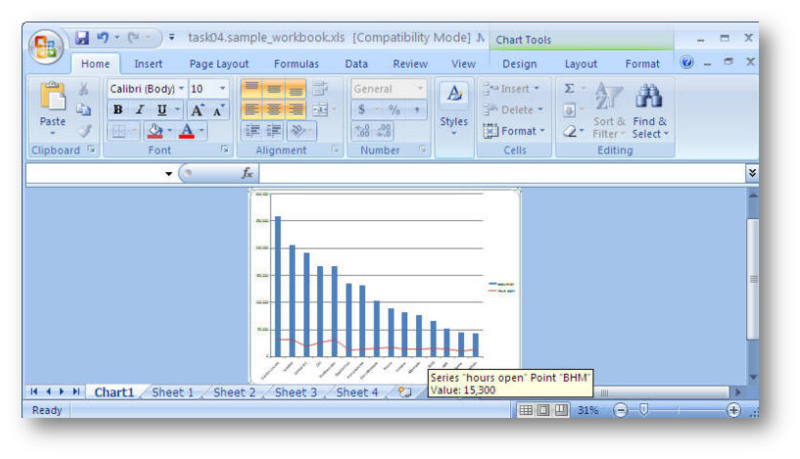 The tool will place the selected chart type on the same worksheet. 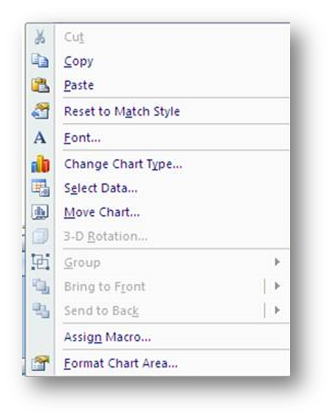 You may wish to change this by moving the chart location to its own sheet. 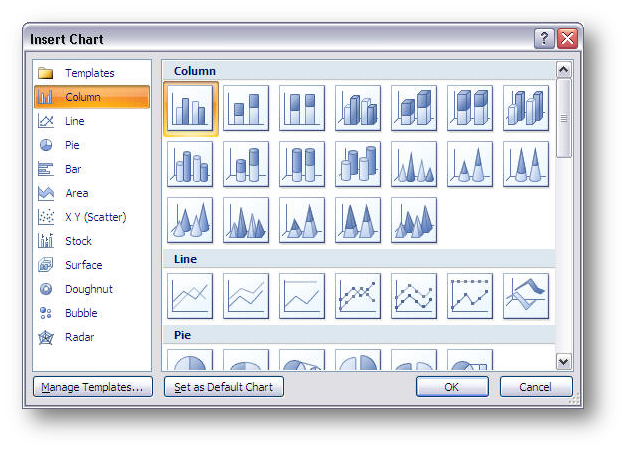 To work on making the chart look and display as you wish it to, right click to reveal the chart editing options. 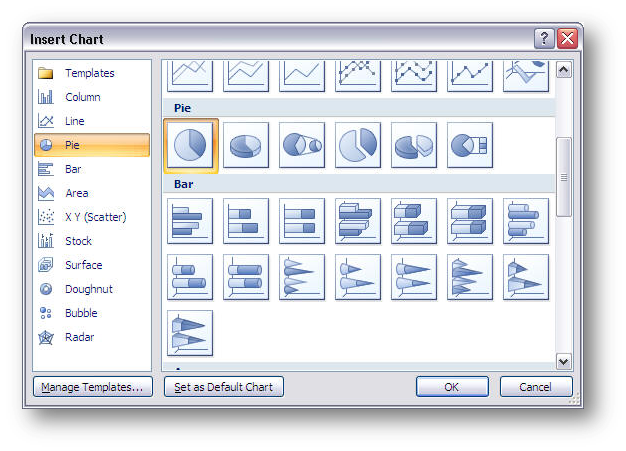 and more depending on what options were selected in creating the chart. 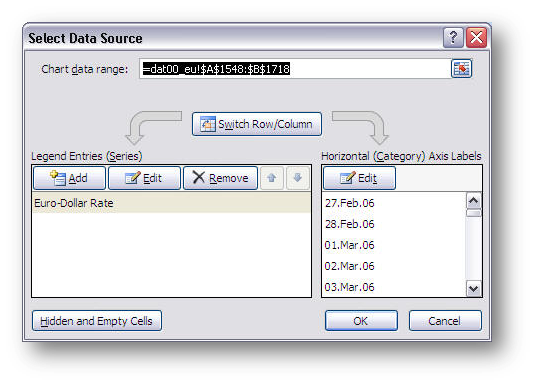 You can also do more specific editing by right clicking and selecting the data to edit. When you put your cursor over an area of the chart, a tooltip appears. 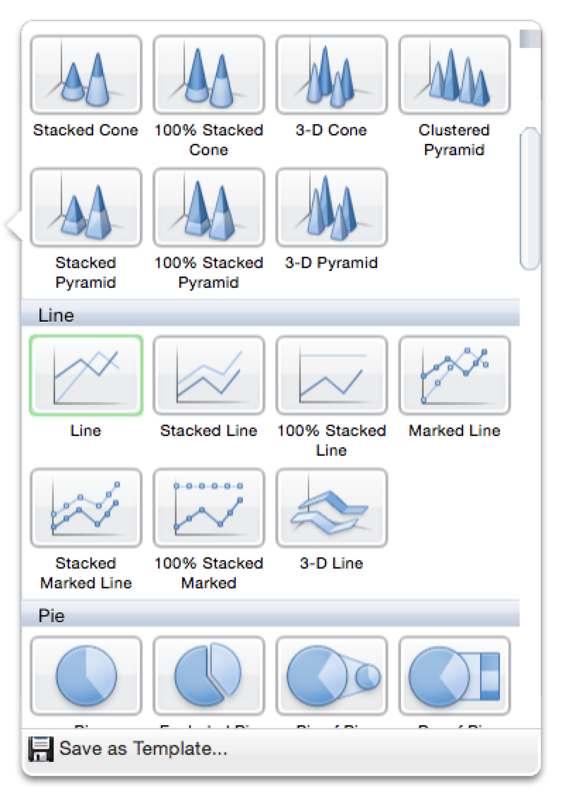 The tooltips provides chart information. 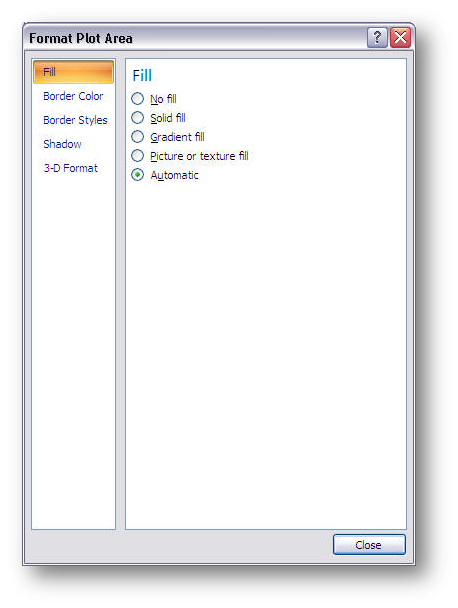 Each of these areas can be edited/formatted. 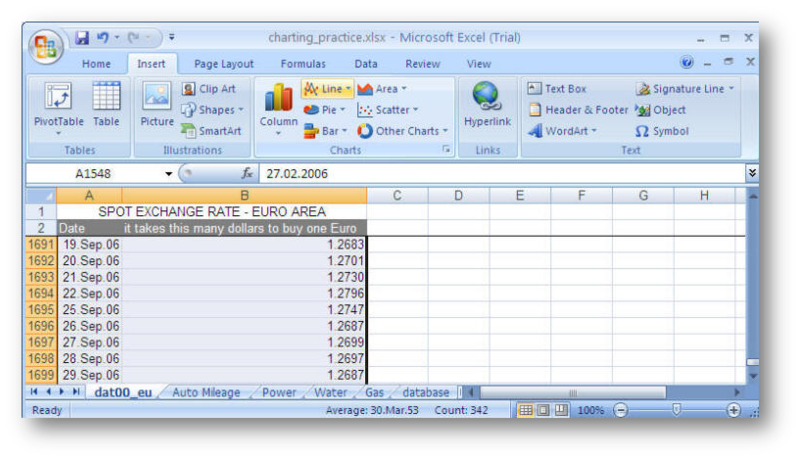 If you put the cursor over data point in chart, the tooltip will tell you the value of the data point. You may wish to add things to the chart that do not exist in the underlying data array. 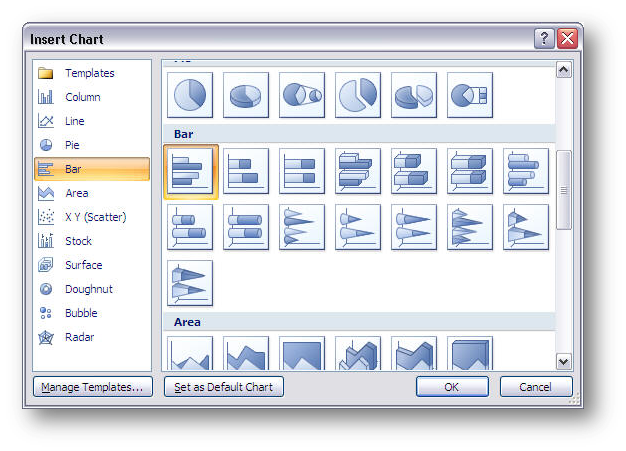 You can add arrows, free-floating text, etc., using the	drawing toolbar, but make sure the chart is selected before you add the arrow, for example, or it won't be put on the chart. 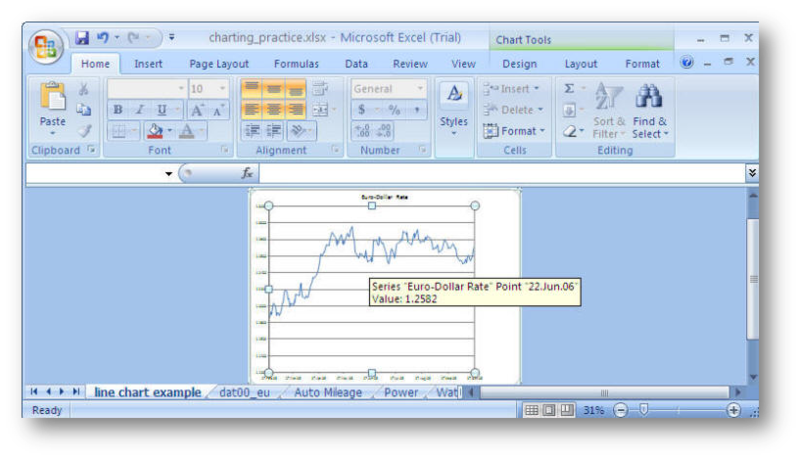 You can chart data on two axes to compare two values. 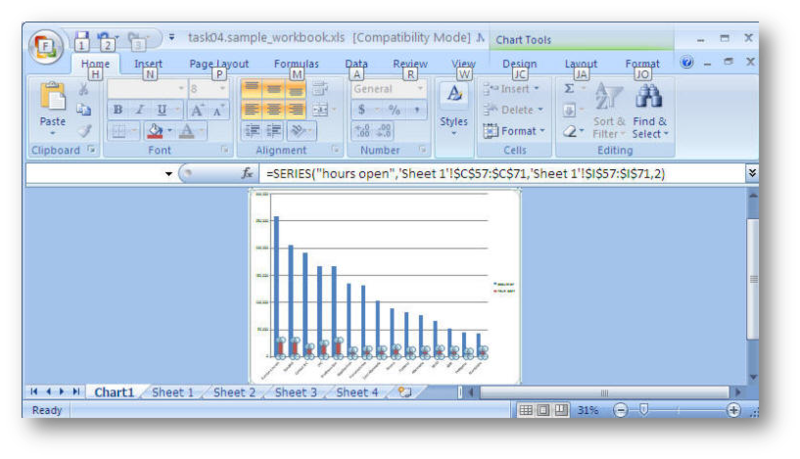 If you want to plot two values on the same grid, you can choose to have two differing axes if you use two differing data types. 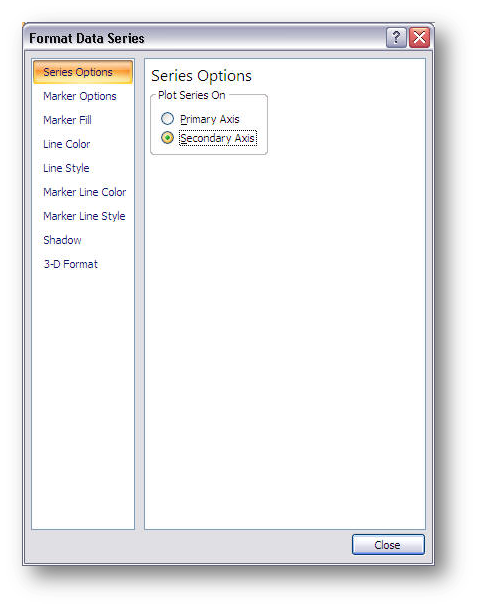 You will need to change the series to a different chart type. 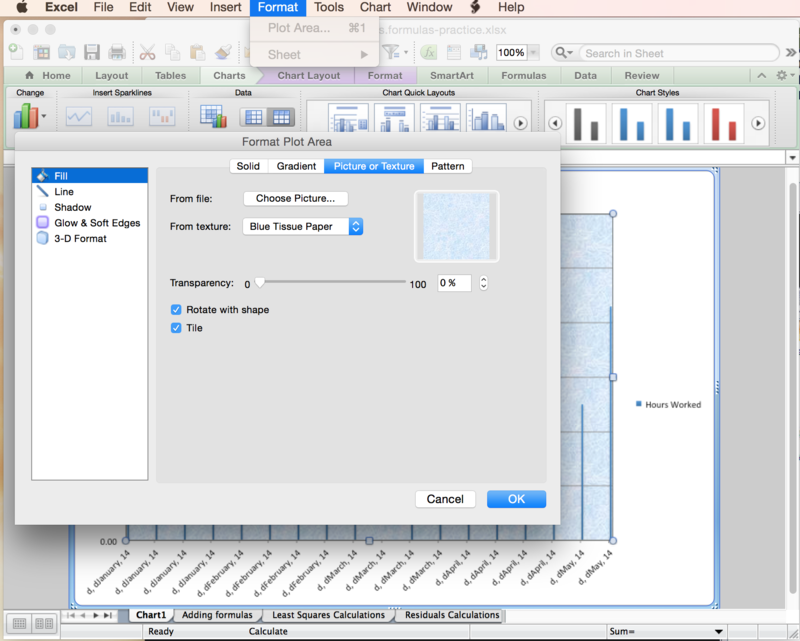 ... which will allow you to have two separate scales on a single grid. 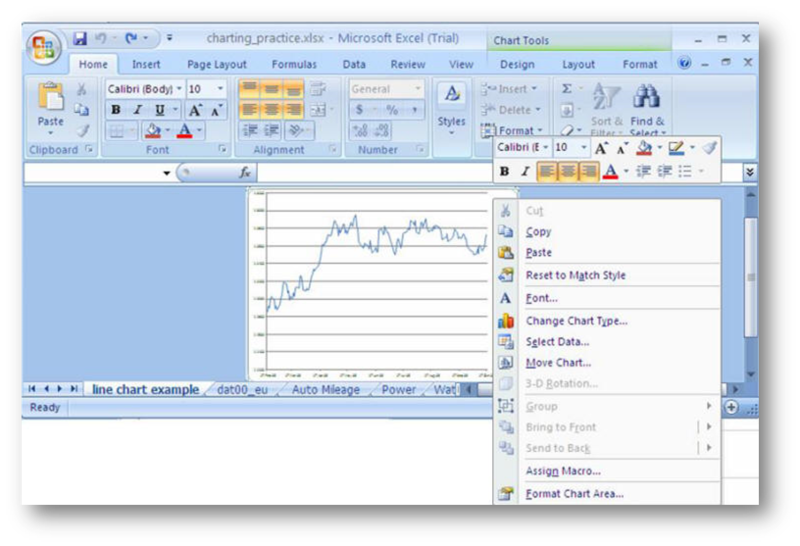 You can make your own charts using the tools available. Jon Peltier offers a suggestion or you can follow Microsoft's advice.